Dangers: do NOT plant kudzu, it'll engulf everything!! Be very careful transporting kudzu so as not to drop any seeds. Kudzu leaves in the wild look like Poison Ivy. Close-up of closed flowers at tip of flower raceme. 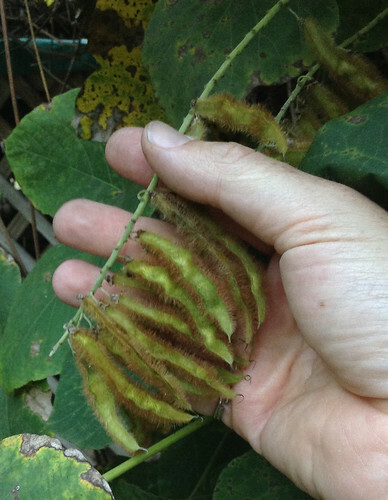 Kudzu seed pods are weirdly hairy. 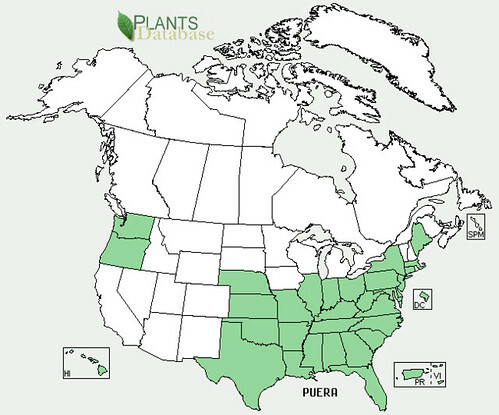 First introduced from Japan to the United States during the 1876 Centennial Exposition, this out-of-control weed now covers over seven million acres of the American South. Kudzu grows up to one foot per day, putting it in the top four fastest-growing plants known. As it grows it covers and smothers all other plant life...along with anything else that doesn't move out of its way. It is a common sight to see mile after mile of trees, powerlines, and abandoned homesteads covered in kudzu as you drive the backroads of the South. It is small compensation that the kudzu can be eaten. It's vine tips are tender and full of important compounds such as antioxidants, as well as being high in protein (16% dry weight). 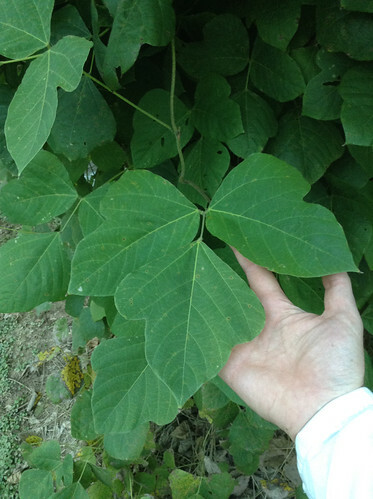 The hairs on the vines and leaves make them unpleasant to eat raw, but a quick dip in boiling water wilts these hair so they no longer cause any problems. After boiling the vine tips and young leaves for 30-60 seconds they can then be used in any manner one would cook spinach, collard greens, or other leafy green vegetable. Kudzu begins flowering in July and continues into September, producing an intense, somewhat artificial, grape smell. Open kudzu flowers can be used raw and make a colorful, flavorful addition to salads. They can also be seeped in hot water to make a tea. These flowers will last a day if kept in the refrigerator. Kudzu roots can grow to enormous sizes, eight feet long and over 200 pounds! They contain a large percentage of starch but are also fibrous at that size. You are better off digging up smaller roots, 1.5" to 2.5" in diameter, which can be roasted like a potato. Be sure to peel the root before eating. The peeled roots can also be pounded, grated or ground into a gluten-free flour. The starch in kudzu roots can be fermented to produce alcohol. Woo hoo!! Roots are best dug up in the early fall but can be harvested all winter if you need the calories. The seed pods are green in color and are not edible, nor are the seeds they contain. Beware of poison ivy mixed in with kudzu. Please do not plant kudzu as it will escape your control and devour everything that doesn't move.